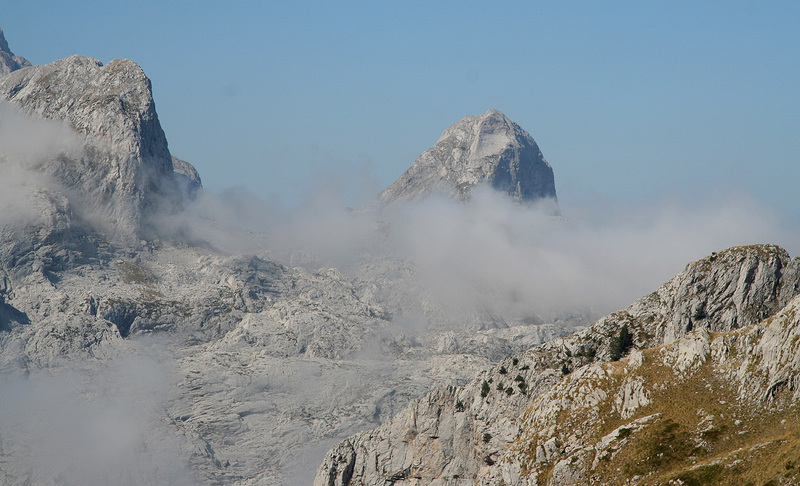 Go see the complete list of mountains climbed on this trip as well as some general advice on Albania. From Tirana (or Tirana airport), go north on the main Hwy. to the city of Shkodër. 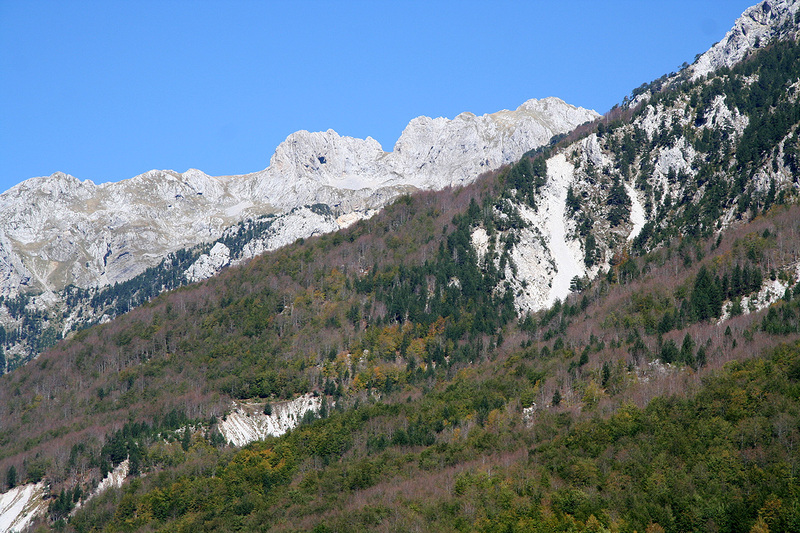 From there, continue north (direction Montenegro) to the village of Koplik. 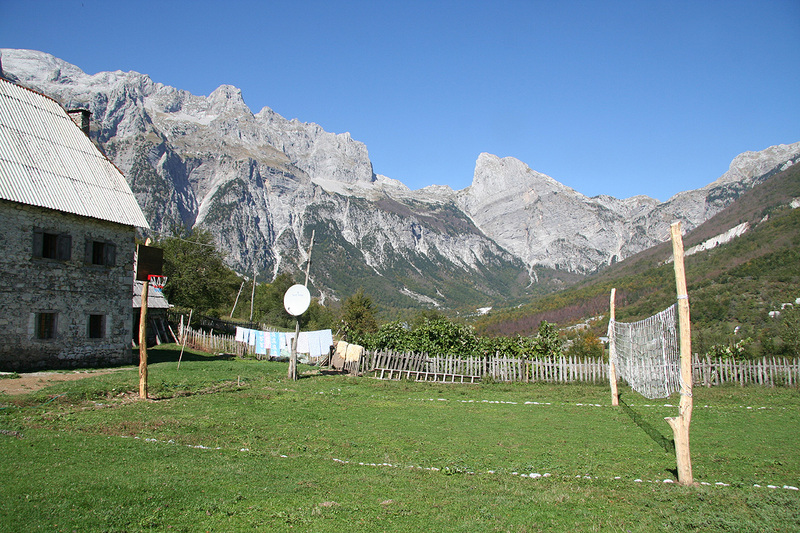 As you approach the center of this village, look for a road that forks right with a sign saying "Dedaj 13 km". This is approximately 90 kilometer from the airport near Tirana. Measure from here. This road runs into a valley, across a mountain pass, then descends to the small community Thethi located in a pretty remote valley. The following description giving both kilometer and approximate driving times should be helpful when navigating to the trailhead. 0.0 0:00 Sign going right, saying "Dedaj 13 km". 19.8 0:37 Paved road ends (2007). 31.2 1:02 You drive by a cemetery. 57.6 2:27 Turn left into local farm/guesthouse. Actually, one may continue driving downhill and cross the river, then continue up the valley to location N42:25.671, E019:45.703, elevation 958 m. However, the car will then be unattended. We were advised to leave our car (safer) at the farm and rather hike this relatively short section. From the farm, follow local paths diagonally down and across the river on an old, wooden bridge. The people there will provide details if needed. On the other side of the river, you head straight uphill and regain the road. Follow the road until near its end, essentially to the alternative trailhead described above. At this place you can collect drinking water if needed, this may be difficult to find higher up. Follow the the trail as it heads straight towards the very end of the valley. 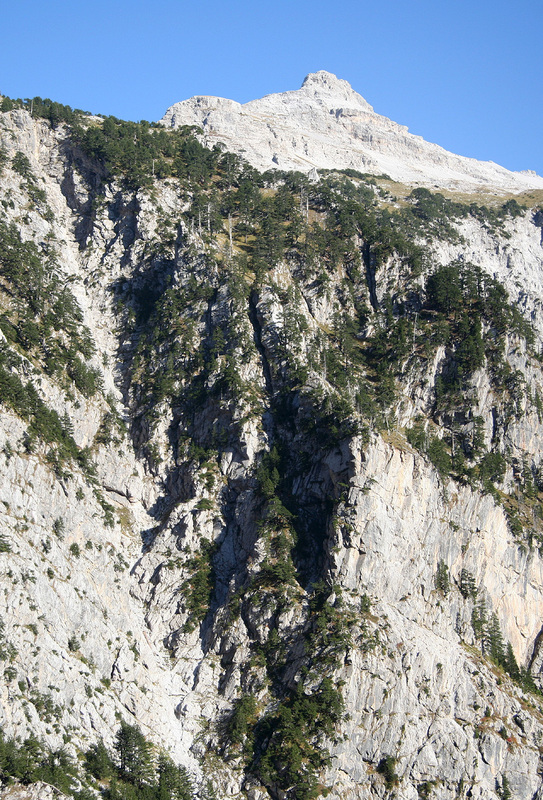 This valley ends in a quite steep wall of cliffs. 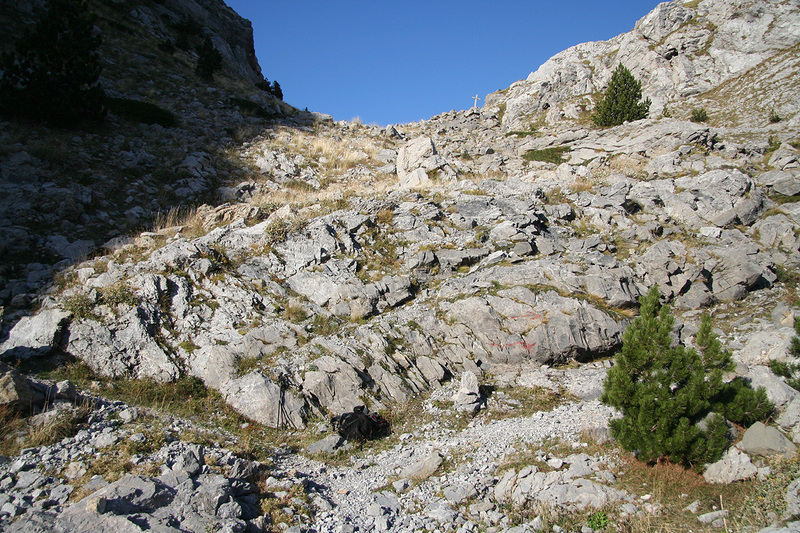 The trail zig-zags uphill below a huge overhanging cliff, then elegantly traverses left. 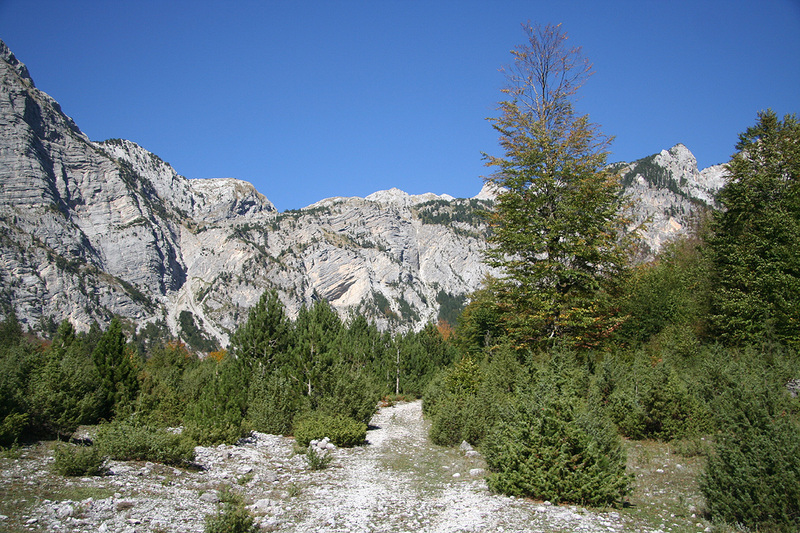 After gaining more elevation, the trail continues uphill (slightly rightwards) towards a saddle that will lead across to Montenegro. However, before you reach the top, there is a pretty obvious trailfork. 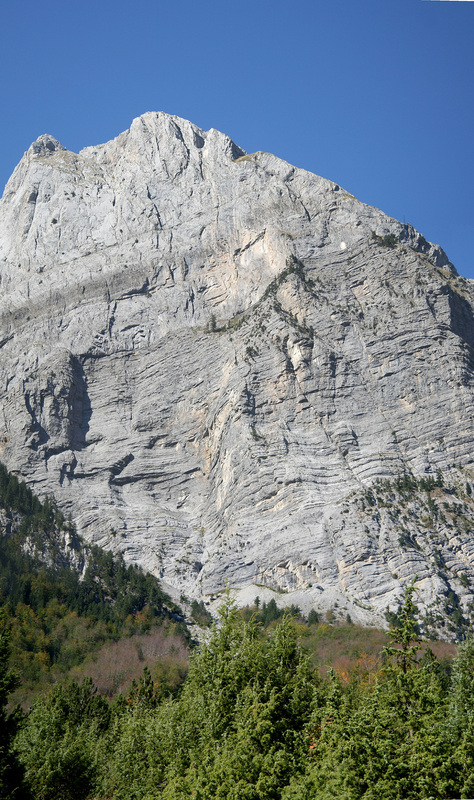 Red arrows pointing in opposite directions are painted on the rock and the location can further be identified as being just below a very visible cross that has been erected a little higher. The location of this trailfork is N42:26.559, E019:46.216, elevation 1668 meter. Take the right fork. This trail now climbs gently while traversing right. It will reach a small saddle and then descend into a small depression which is fairly flat. 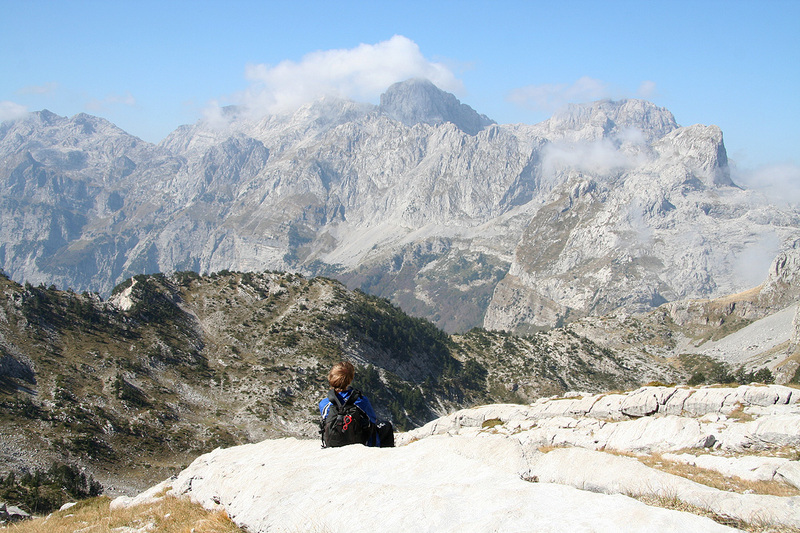 From this saddle, Jezerces comes into view for the first time. One may camp here. This location is N42:26.532, E019:46.899, elevation 1727 meter. If one follows the trail that stays in the hillside just right of this depression, one will within a few hundred meter enter a much larger, flat area covered by grass. 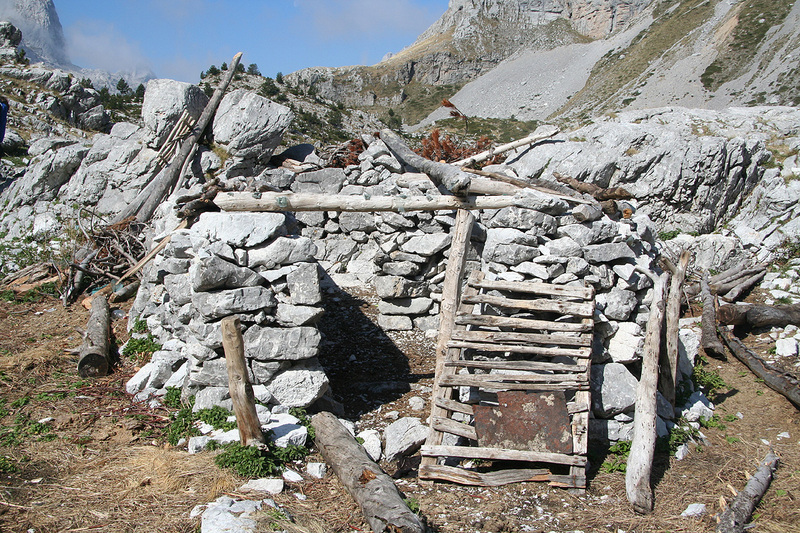 There are old ruins of shepherd's huts in this area. This would be an alternative, very nice place to camp. 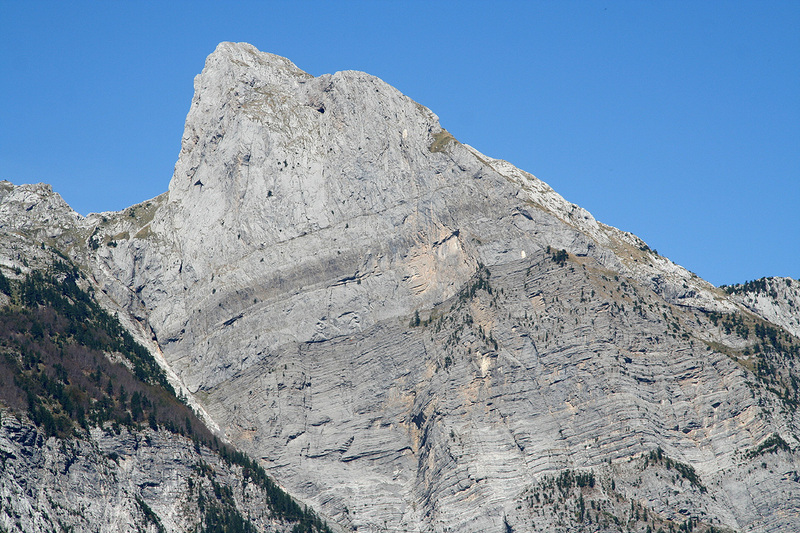 From the areas described above, the peak is within easy striking distance. Head uphill along grassy slopes. You will see a very clear cut (notch) in the rocks up ahead, slightly to your left. This is NOT the route. More to your right, there are several rocks, one quite distinct with a sort of upwards pointing block on its very top. The (best) route shall stay to the right of this point. See the photograph for further details. 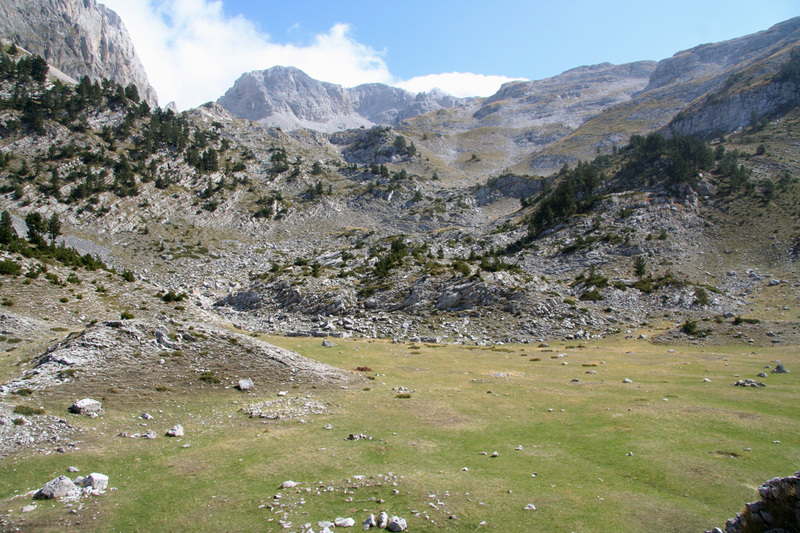 The deeper valley that you will have on your right, actually turns sharply around these rocks in a huge left curve. The key to good routefinding here is to either climb the rocks just right of the "pointing block" or traverse a bit more right below more cliffs, then turn the corner and ascend along the ridge, now with the deep depression on your right hand side. If you go more directly, just right of the "pointing block", you will end up on the opposite side and meet the alterntive route that will merge in from your right side. Either way is fine. 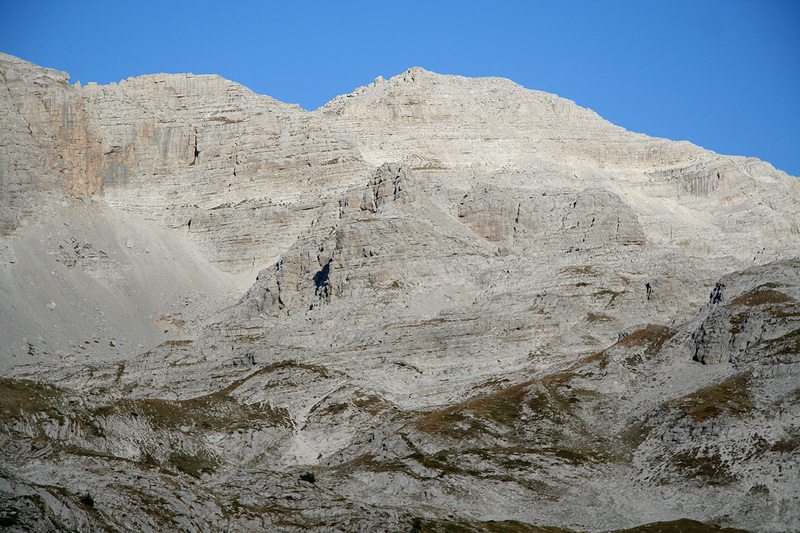 As you ascend along the depression that is now separating you from the peak itself, look for a suitable place to exit right without loosing much elevation, in order to cross the talus/scree and gain the wide grassy slopes on the opposite end. 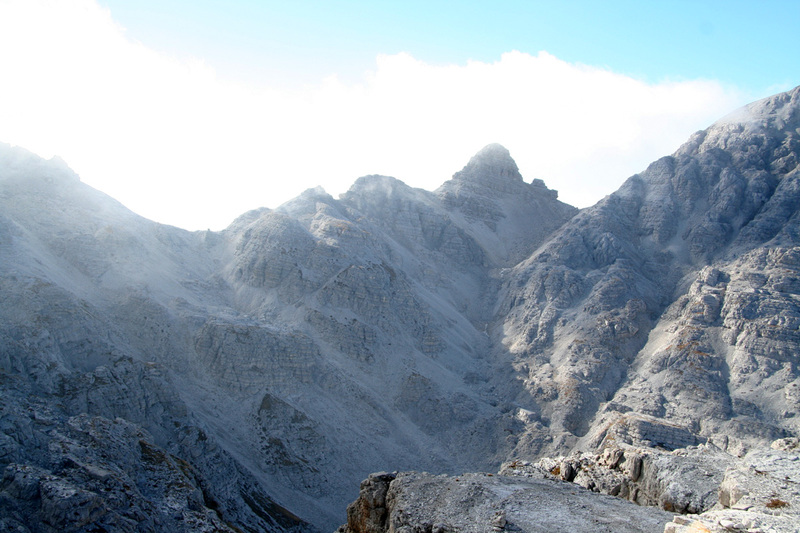 From here, ascend easy terrain to a distinct col on the main ridge. Study the picture for precise identification and more details. 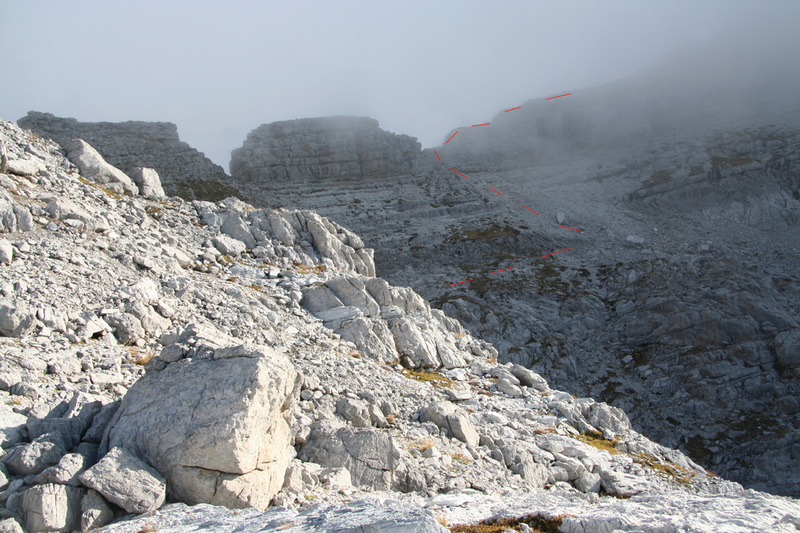 In this col, scramble rather easily upwards (to your right) and follow the top ridge a short section, then proceed a bit below and on the right hand side of the top ridge. Look for an easy passage that will get you 2-3 meter higher up. There are at least two places where this can be done easily. 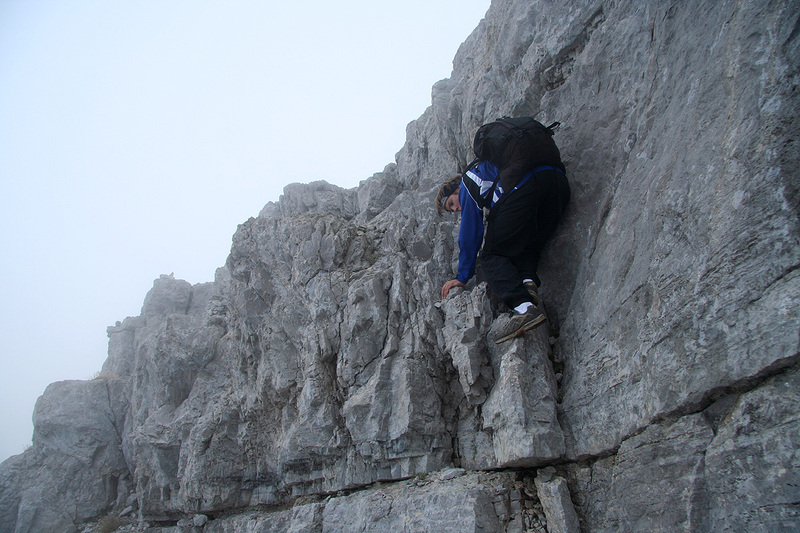 The climbing here is well protected and quite easy, but rates as YDS class 3. This section is only a few meter. On this higher level, there is a pretty wide and very distinct ledge that will take you further along, also this time on the right side of the main ridge. This ledge gives direct access to easier terrain where you should ascend uphill and gain the very natural col on the main ridge. This location is at N42:26.584, E019:48.623, elevation 2600 meter. From here, one starts out up the main ridge which is now quite broad and full of variable sized rocks. As you get higher, traverse left among huge boulders. In this area you will pick up red trail markers that leads directly to the summit. Even without these, the remaining part is easy, just proceed uphill where possible while staying left of the highest ridge until you again regain the top ridge for an easy stroll the last few meter to the summit point. 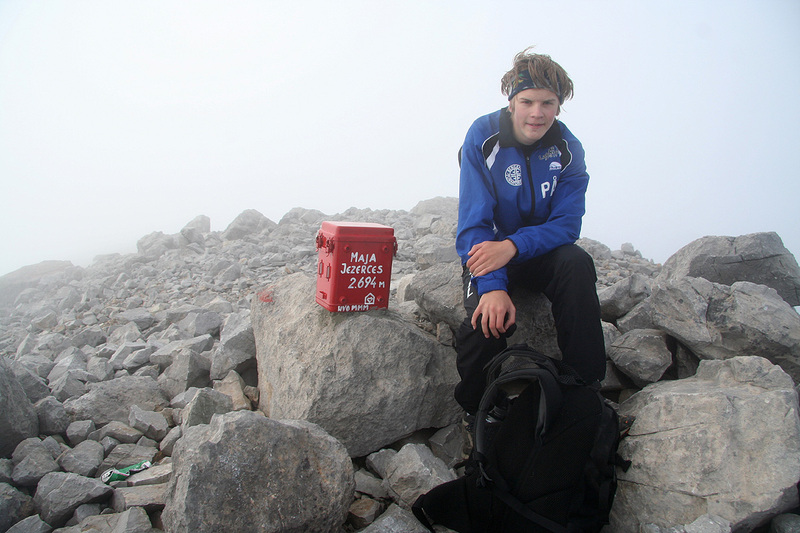 In August 2007, a red metal box serving as a trail register was placed on the summit. I suspect that it will come loose, hikers should then just see that it is placed between rocks inside the small ring of rocks that define the summit area. N42:25.671, E019:45.703, 958 m. 0:00 End of road, trailhead. N42:26.559, E019:46.216, 1668 m. 1:30 Trail fork, go right. N42:26.532, E019:46.899, 1727 m. 2:05 Flat grass area, possible camp. N42:26.574, E019:47.618, 2027 m. 2:37 Waypoint on the route. N42:26.613, E019:47.798, 2108 m. 2:52 Waypoint on the route. N42:26.421, E019:48.038, 2243 m. 3:12 Waypoint on the route. N42:26.457, E019:48.123, 2268 m. 3:22 Waypoint on the route. N42:26.438, E019:48.275, 2355 m. 3:32 Waypoint on the route. N42:26.512, E019:48.346, 2417 m. 3:42 Waypoint on the route. N42:26.624, E019:48.502, 2497 m. 4:00 Waypoint on the route. N42:26.571, E019:48.605, 2574 m. 4:10 Waypoint on the route. N42:26.584, E019:48.623, 2600 m. 4:14 Last col on the ridge. N42:26.524, E019:48.770, 2694 m. 4:30 Summit. September 29. Travel day. Pål Jørgen travelled from Bergen via Copenhagen to Vienna, while I drove from Linz to Vienna this Saturday morning. 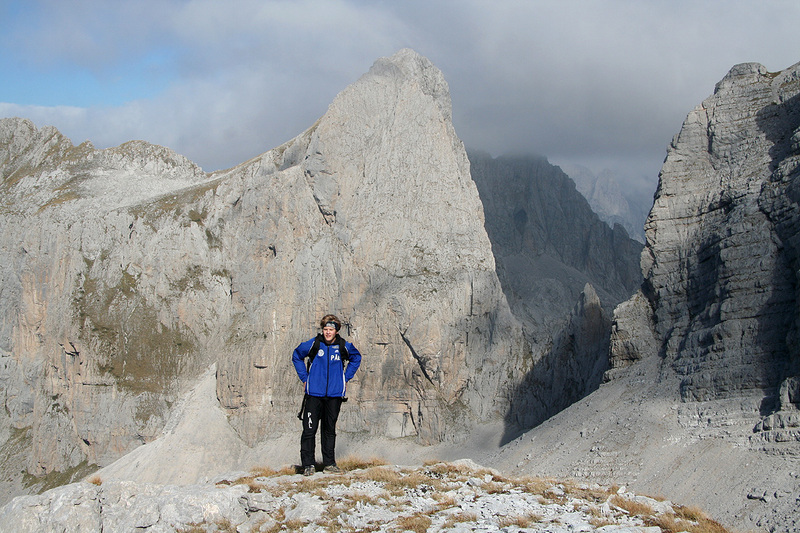 Originally, this fall break was planned for Slovenia and the Dolomites, however, a very miserable weather forecast had made me change plans at the last moment. 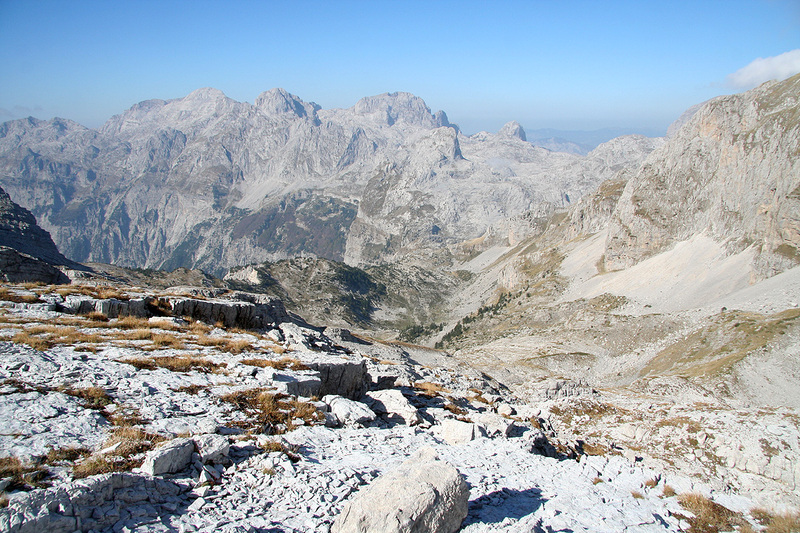 Thus, we were booked on an evening flight to Tirana in Albania for a week of exploring this somewhat "unknown" country and hopefully find our way to a few of its ultra prominent mountains. We took a trip to the center of Vienna, walked around and had lunch before returning to the airport. Our flight departed at 2225, arriving essentially at midnight. I had made arrangements for the rental of a Pajero Sport Diesel 4WD truck, and reserved a room at the very nearby airport hotel. This was all in the best order and we hit the bed as soon as possible. September 30. Travel to high camp. 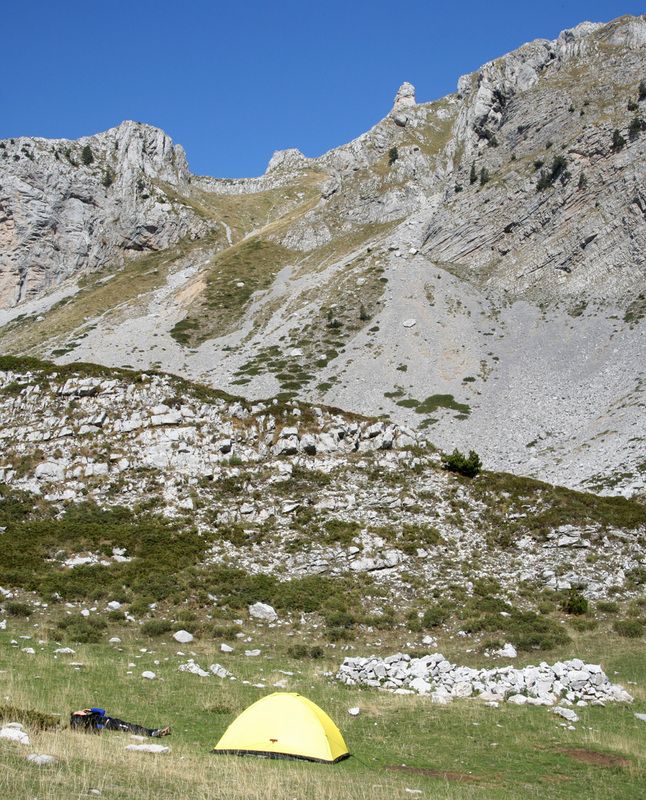 We started out after breakfast and headed north towards Shkodër. 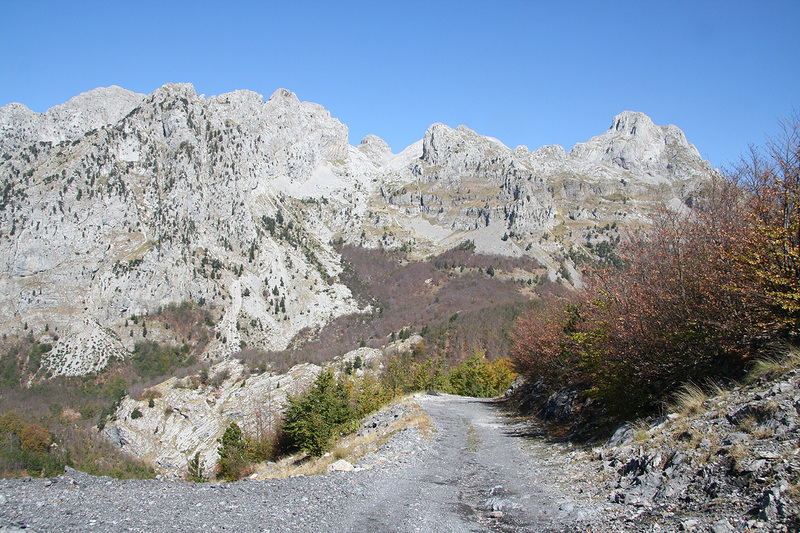 The adventure did not really start until we had left the paved road and navigated the not so good dirt road up the slopes towards the pass that separates Tethi from the western part of Albania. 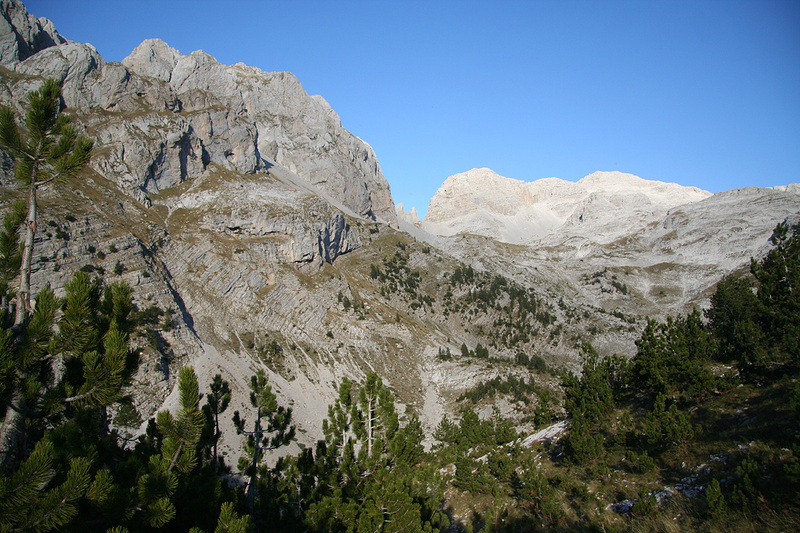 What a facinating landscape, great mountains and deep valleys. The arrival into the Thethi valley was really nice. This valley is remote with a lengthy access along a pretty bad road, then this rather isolated valley with its steep mountains and friendly, hospitable people. I immediately thought about how isolated people living here must have been in the past and possibly still are during winter time. We noticed the sign pointing left to the little farm that welcomed visitors and decided to check if we could have a somewhat late lunch there. No problem, but since they did not know that we were coming it would take an hour to prepare. OK, we could rest and look around after the pretty long travel from Tirana. We met a Dutch couple there, they had participated in some restoration project and the man told me many stories about the valley and its local people. Lunch was all made from local, valley products as is necessary if the connection to outside is long and complicated. We agreed that the car should remain here while we climbed the mountain. We started out around 1500, the plan was to hike partway then camp in order to climb the mountain in the morning and hopefully, have time to drive towards Korab. Even before leaving the road that heads up towards the end of the valley, one must simply stop and look at the scenery. There are few valleys with similar qualities. Vertical walls seem to abruptly close the valley. I wondered where the trail would climb out. As we came nearer, there was one possibility and sure enough, precisely there, the trail had found an exit. 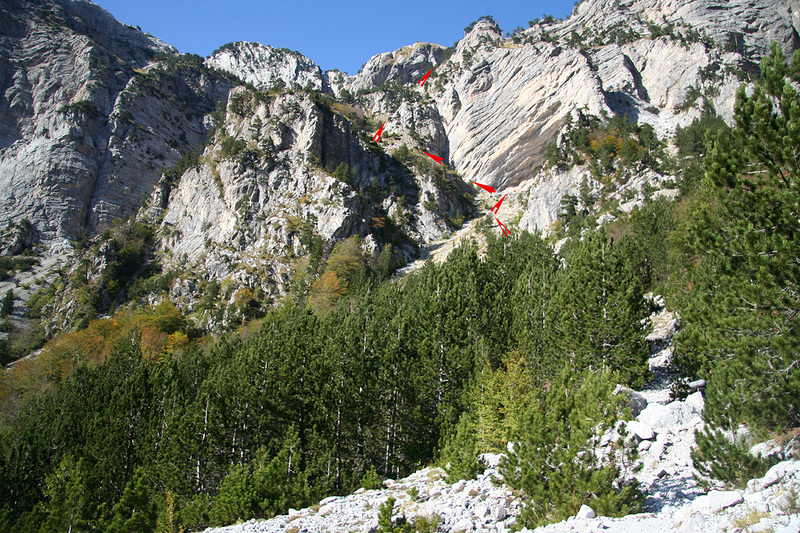 By zig-zags up to and actually under a huge overhanging cliff, then an elegant traverse and a way up and across to Montenegro was established. The peaks on either side were shining in the aftenoon light. A landscape quite different from any other in Europe. 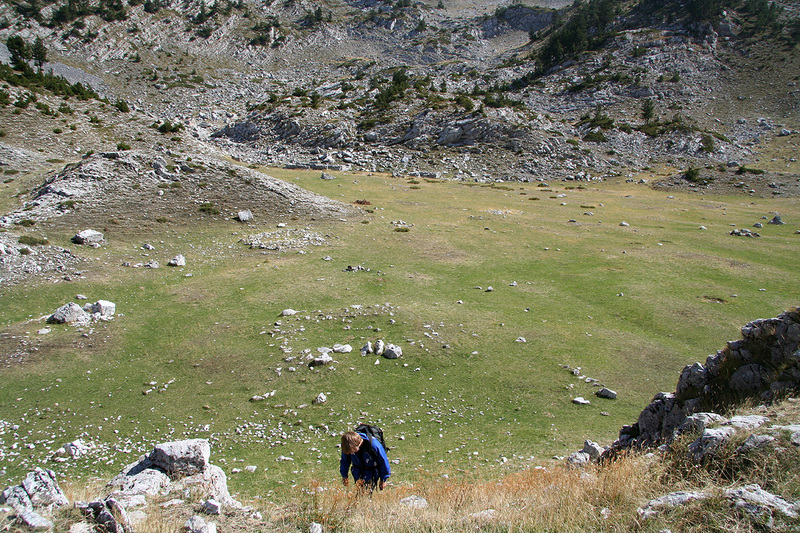 However, before crossing to Montenegro, we found the trail fork that would lead us to a rather hidden away valley with grass that the shepherds have used for their sheep and goats since very long time ago. 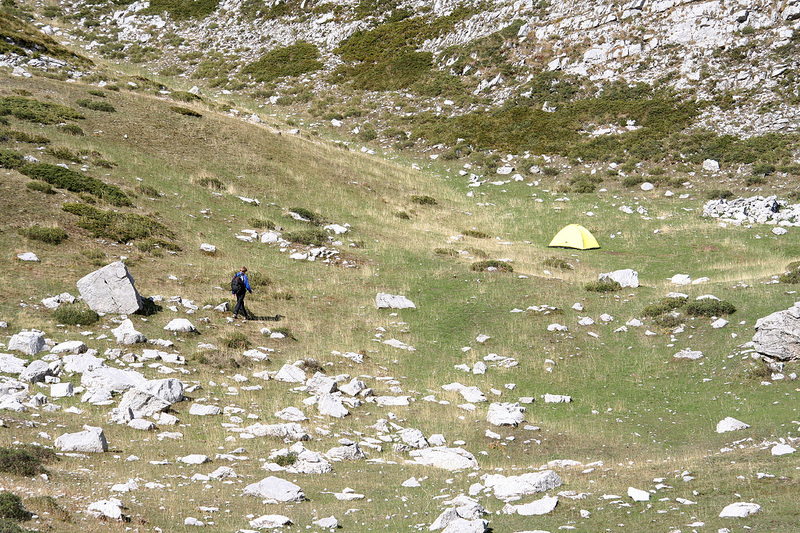 We stopped at the first flat area around 1715 and established camp. This was according to plan, we had seen the mountain and knew that we could climb it the next morning. October 1. Summit day. We got up at 0600 and were on our way up the first hills by 0630. 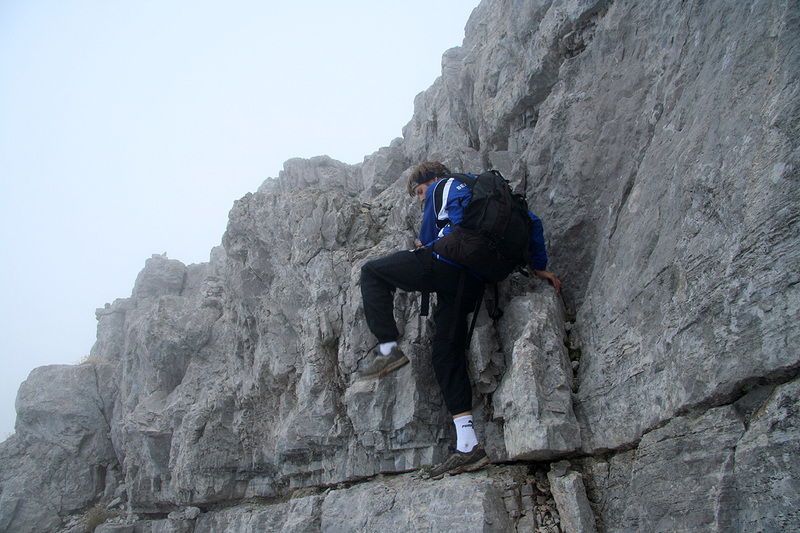 It was pretty clear that this ascent would involve a bit of route-finding. The first part was pretty clear, up the hill in the broad valley until last grassy ridge that cuts across. Our valley was still in the shade, but the sun was shining brightly on the peaks behind us. The next leg consists of very heavily water eroded rock. 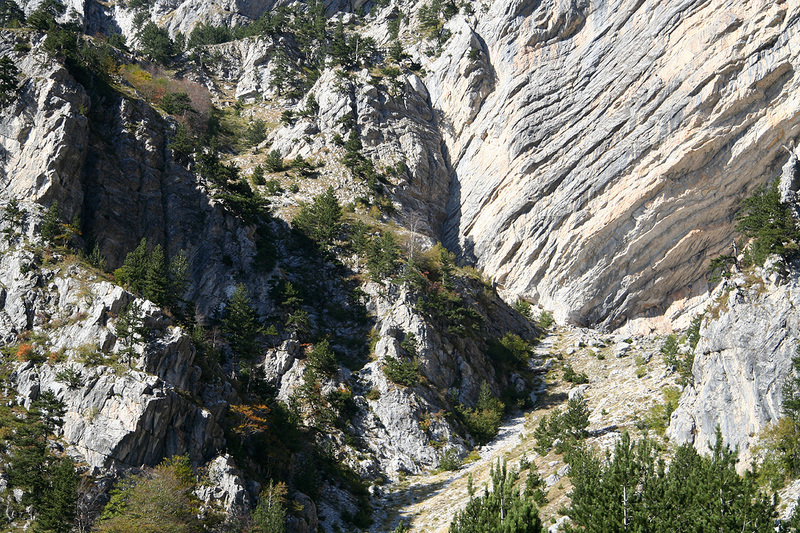 The water has carved deep holes and what reminds of glacier crevasses in the limestone rock. We ascended by contouring around before gaining elevation along the ridge above the valley/bowl below to our right side. On the return, we cut right across this area and descended more directly quite close to the characteristic rock tower that can be seen from below. It now got foggy and we could not easily see the rest of the route. However, common sense and experience dictated a traverse across the talus field, then a gradual ascent leading us to the col on the main ridge. From here, the route more or less unfolded quite naturally. The climbing section was both short and easy and by 0850 we stood on the summit. Unfortunately, the summit was in the middle of a cloud and the temperature was low enough to discourage any lengthy stay. We signed the newly esablished summit register, noting that by far the most visitors to this peak were Czech people. We left the summit after 20 minutes and descended out of the cloud and back into sunshine. The view of all the mountains around us came back with full force. We descended via the other large grass area and noticed ruins after old shepherd's housing. A good break was called for when we returned to camp at 1120, before our final 2 hour descent back into the beautiful Thethi valley. Saying goodbye to the friendly people at the farm, we headed back out across the mountain pass. The day was not quite over as we rather ambitiously hoped to reach the eastern city of Kukes before finding a hotel for the night. In this way, we could aim for Korab already the following day. This was easier said than done, the main Hwy. heading east turned out to be of very variable quality. We stopped about 40 minutes for dinner, then continued driving with the hope to be in Kukes by 0900. This hope was effectively destroyed when we hit a sign saying Kukes 70 kilometer at a point where our map indicated that only about 45 kilometer remained. Later, we turned a corner and drove straight into a recent rock-fall that had hit the road. Numerous rocks of variable sizes as well as a few weighing more than 500 kilogram were scattered all over the place. Just to make the driving experience complete, as we saw the lights of Kukes, the highway ran straight into some sort of industrial site with no signs and no clear continuation. We first assumed that the side road would lead us back onto the proper highway, but this was not so. Going back to investigate further (pitch darkness everywhere), we noted some small cairns like you often see in the mountains. 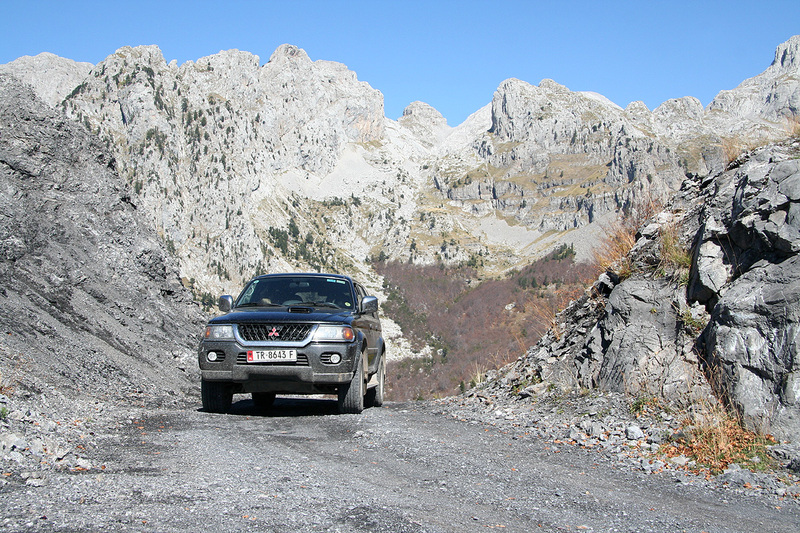 Driving from one cairn to the next provided the key on how to complete our journey to Kukes. Arrival 2230. 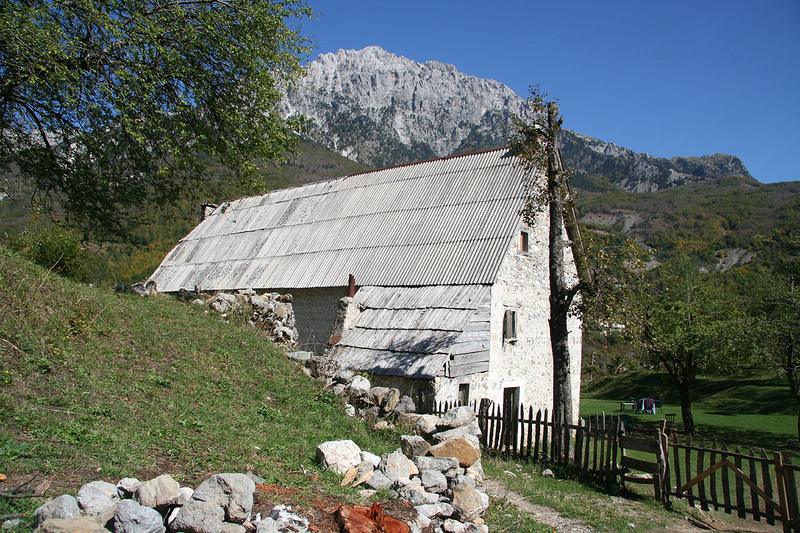 This trip continued to Korab. 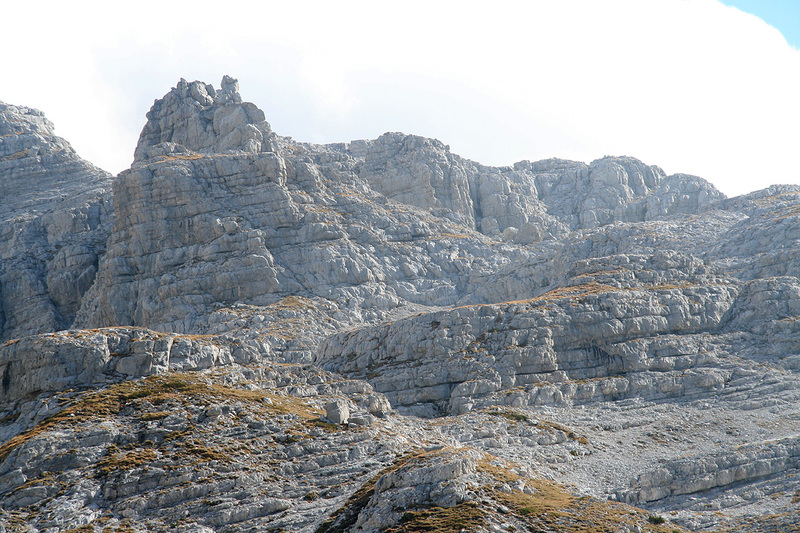 Jezerces, the terrain is more complex than it looks. The crux of the route, it is short and not very hard. 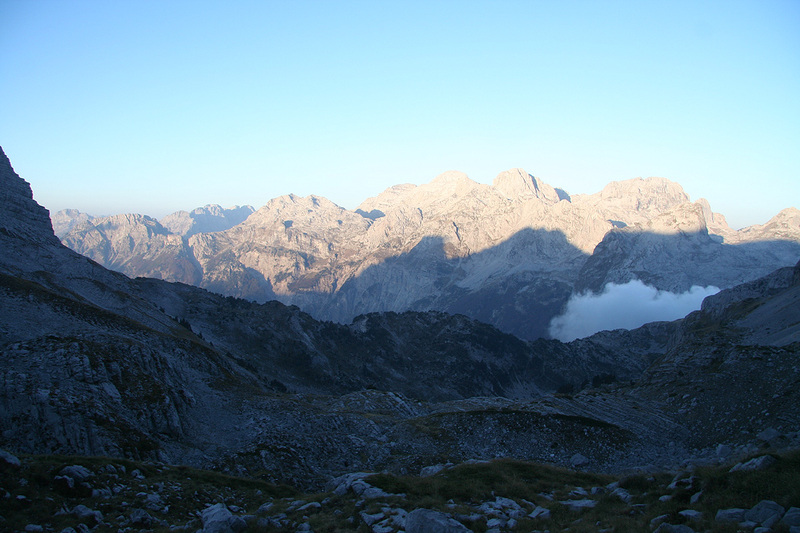 Panorama view from the upper part of Jezerces.